"Based on Lev Grossman's New York Times best seller, The Magicians centers on Quentin Coldwater (Jason Ralph), a brilliant grad student chosen to attend Brakebills University for Magical Pedagogy, a secret upstate New York university specializing in magic. He and his 20-something friends soon discover that the magical fantasy world they read about as children is all too real -- and poses grave danger to humanity." 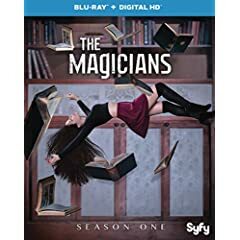 That's the official description for Syfy's new series The Magicians Season One, now on Blu-ray, DVD, and Digital HD. Sound familiar? Yes, I thought so too, even though I've never read the book. At first, The Magicians just seemed to be a more grown-up version of Harry Potter. We have a lonely main character who learns that he can do magic, and then goes off to a secret (and yes hidden) school to learn how to utilize his powers. However, although the series has a slow (and familiar start), things get more diverse and interesting after the first few episodes. As the season progresses, we're introduced to a more involved storyline, more complex magic, and deeper lore that makes you want to learn more about the characters and where they're headed. We also eventually get to see the magical fantasy world that we're teased with during most of the season and we get to meet the main villain of the story. I won't say anything beyond that so as not to ruin the show for those of you who haven't read the book. Regarding the technical aspects of the Blu-ray, The Magicians provides the usual 1080p picture with a 1.78:1 aspect ratio. The video quality is very good and the show provides a nice visual separation between the magical and the real world via differing color ranges. For audio, we're provided with a English DTS-HD Master Audio 5.1 track with English SDH subtitles. The dialogue is clear and the soundtrack provides a nice backdrop. There's not a lot in terms of bonus features. Each of the three discs provides deleted scenes that are entertaining, but don't really lend any additional needed info to the story. Disc three also provides an 8-minute gag reel that's fun to watch. In addition, there's a short 13-minute behind-the-scenes featurette entitled The World of The Magicians. This provides a great look at how the show was put together, although it would have been even better if is was longer and went into more detail. So, if you've read the book and you're a fan, then you'll want to watch the show. If you haven't read the book, I can still recommend the show. You just need to get through the first few episodes and then you'll be drawn into all the mystery and suspense provided by The Magicians.